“Today is a win for everyone in our community,” says Aliya Balo, president of the Oromo Association of Manitoba. TREVOR HAGAN / WINNIPEG FREE PRESSTeresa Fekensa got support from the local Oromian community during the Manitoba Marathon. Although Teresa Fekensa has never been to Winnipeg before this weekend, he felt right at home at the Manitoba Marathon. The 35-year old, who immigrated to Toronto two years ago, won the men’s full marathon with an impressive time of 2:38:03.2. Despite travelling from out of town for the event, Fekensa may have had the biggest cheering section. 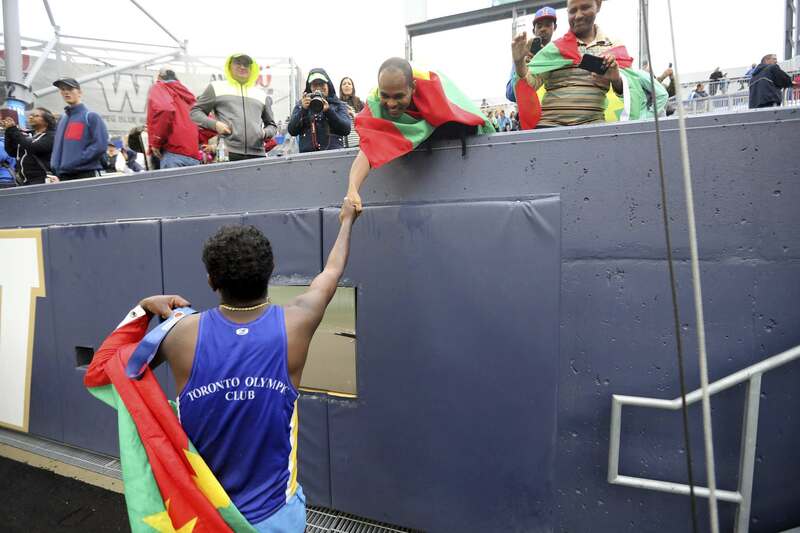 Members of the Oromo Association of Manitoba came out to support him, as nearly 20 local Oromians proudly waved their flags as Fekensa crossed the finish line. 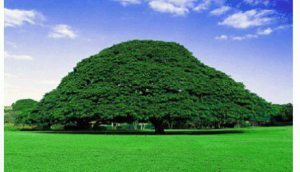 Oromia is a region in Ethiopia, where Fekensa is originally from. TREVOR HAGAN / WINNIPEG FREE PRESSManitoba Marathon winner Teresa Fekensa with the flag of Oromia. None of them had any relation to Fekensa or really knew him before he made the trip for the marathon, but when they heard one of their own were coming in to compete, they wanted to show their support and make him feel comfortable. Fekensa immigrated to Toronto because he felt he wasn’t getting the right training, but more importantly, because he was protesting against the government. Thousands of protesters in the Oromia region have been killed, so for his safety and passion for running, he had to leave. Members of the Oromo Association of Manitoba say their people back home have no freedom and are under military control. To show their support for the protests, they cross their arms above their heads, which is exactly what Fekensa did when he crossed the finish line at the Manitoba Marathon. Fekensa’s achievement shows that Oromian’s can not only participate in the Canadian community, but also succeed, Gobena says. 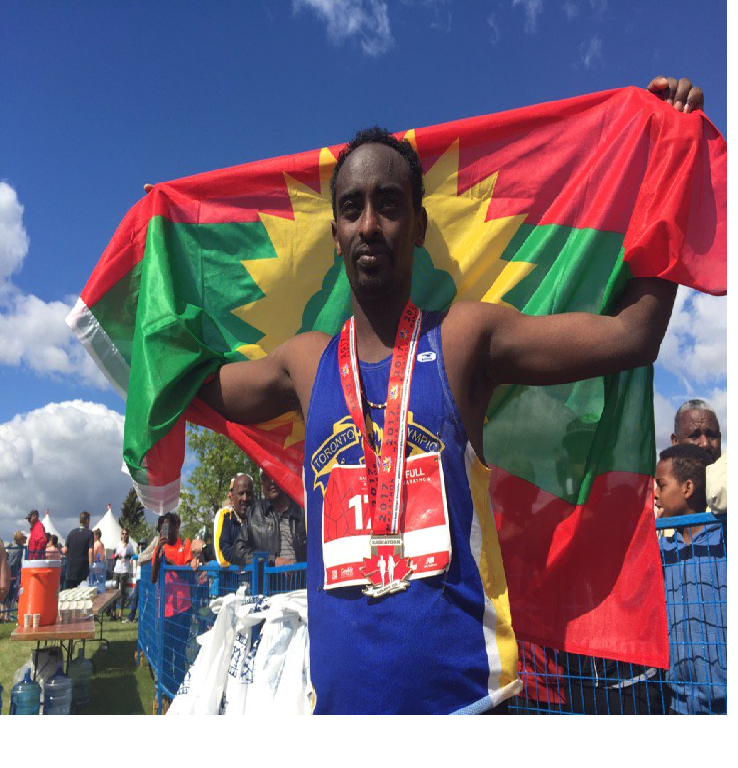 He hopes Fekensa can open the door for more Oromian runners to come to Canada and is thankful to the Canadian government for giving his people freedom. 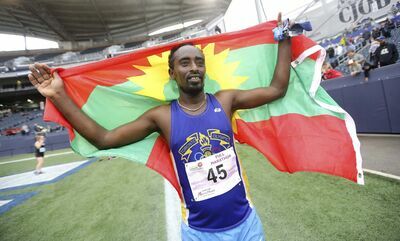 Fekensa, who was happy to have the support of local Oromians, says he plans to return to Winnipeg next year to defend his title. But that’s not his only goal for the future. “My goal is to run for Canada and win for Canada, in any marathon,” he says. Emily Ratzlaff, a local physiotherapist, was the first woman to cross the finish line in the women’s full marathon. It was her second time competing at the Manitoba Marathon and her first time running the full marathon. “I’m surprised that I won,” says the 31-year old who finished the race in 3:14:38.8. When she was four miles away from the finish line, she was told she was the leader and she couldn’t believe it, she says. “I was excited, but I was also in pain so I just needed to keep running and finish,” says Ratzlaff who has competed in the Boston Marathon twice. In the half marathon races, it was a pair of Bisons that stole the show. University of Manitoba Bisons’ track athlete Daniel Heschuk, 20, finished first in the men’s half marathon and 26-year-old former Bisons’ track athlete Jaclyn Adamson was the winner in the women’s half marathon. Adamson came into the Manitoba Marathon with some extra confidence from winning a marathon in Fargo last month. Adamson was surprised she ran this quick at the Manitoba Marathon because of the weather conditions. It was hard to get traction with the roads being slippery and that her clothes quickly felt heavy from all the rain, she says. It was a difficult race for Heschuk, who is originally from Neepawa. Heschuk was unable to make it to the medal ceremony as he needed medical attention after the race. “Honestly there was a couple times during the race where I thought I couldn’t do this anymore,” he says. Heschuk says what got him through those tough stretches was thinking of his uncle Mark Cameron, who died last year at the age of 40 from complications in a surgery. His uncle went through a lot, as he lived with a learning disability and survived a leukemia diagnosis at the age of five. He says his uncle was a huge fan of Terry Fox and participating in the Terry Fox run, so he wanted to dedicate this year’s race to him. “If he can go through all this pain growing up, I can go through one hour of pain in this marathon,” Heschuk says.